There can be little doubt that the Civil War had a detrimental impact both on the inhabitants of Appleby and on the ‘civilian’ population of southwest Leicestershire generally. However the full extent of losses inflicted by the rival armies through plunder and despoilation, is obscured by the passage of time, the scattered nature of the written sources, and the ‘remoteness’ of the region. From the outbreak of hostilities in 1642 both the King and Parliament struggled to secure control of this corner of the Midlands through garrisoning strategic towns and strongholds. Their enthusiastic supporters - commanders like the Earl of Stamford and the formidable Henry Hastings of Ashby-de-la-Zouch - raised troops at their own expense or risked life, lands or property to assist their cause. From 1642 onwards the broad tract of country between Ashby, Leicester and the Watling Street became the buffer zone between two groups of rival garrisons - the Royalists in the north commanded by Hastings from Ashby, the Parliamentarians in the south and east controlled through the county committees at Warwick and Leicester. The proximity of these rival garrisons inevitably affected the lives of the smallholders, craftsmen and farm labourers who lived here, for they functioned as centres of recruitment to the warring factions, administrative command posts and military bases from which raiding parties could be sent out to engage the enemy and to forage supplies. Propaganda broadsheets, letters, ‘sequestration records’ and ‘accounts for losses and quartering’ lodged with the county committees and now listed among the Exchequer ‘State Papers’ in the Public Record Office provide evidence of their overall impact on the local inhabitants. vaults under the ground, through which they can go from one fort to another at their pleasure; provisions they have good store; hung-beef plenty round about their kitchen within, and have lately been killing and salting of more. While Leicestershire was pre-eminently ‘the county of Rebel garrisons’ the city of Leicester itself, home of ‘the grand Committees of the Midland district’ was its most strategic stronghold. With its garrison of six hundred troops the town was particularly well placed to obtain ‘early intelligence of the movements of the little flying armies and scouting parties which everywhere abounded in its vicinity’. As the conflict raged the lines shifted. Tamworth castle was captured by the Parliamentarians under the command of Col. William Purefoy in June 1643. The Parliamentary forces planted three other garrisons at Coleorton, ‘within cannon-shot of Ashby’, Bagworth and Kirby Bellars, with a total strength in excess of four hundred and twenty horse and six hundred foot. Their stated purpose according to a Narration of the Siege of Leicester reprinted by John Nichols was to contain the Royalists and ‘recover the lost hundred’ of Framland, provideding support for Sir Jarvis Lucas’s garrison at Belvoir. The pattern of recruitment from the region was set by the local gentry, who were noticeably cautious in their allegiance. Although, as Professor Everitt found, about two thirds of the Leicestershire gentry initially favoured the king, it seems only a handful of the thirty five important families in the county were prepared to take up arms in his support. As David Fleming records, of the thirty or so gentlemen from Sparkenhoe Hundred listed as having had to compound for their estates as Royalists, most played a very minor part in the conflict, and some dithered and changed sides. The more cautious and hesitant, like the Moores of Appleby Parva, seemed to have stayed home and kept out of the conflict. Apart from Hastings himself, who belonged to the king ‘body and soul’, the most prominent Royalists were Sir John Beaumont of Coleorton, Wolstan Dixie of Bosworth, Richard Dudley of Swepstone and Thomas Roberts of Sutton Cheney. Sir John served outside the county. Dixie, initially enthusiastic for the Royalist cause, later became a member of the sequestration committee for the county. Dudley, who sprang early to the defence of his sovereign, paid dearly for his loyalty under the ‘Oliverious lash’, while Roberts served as a major in Wolesley’s foot, seeing the war through to the surrender of Ashby. Their fates are fairly typical of those who could be described as ‘committed Royalists’. Parliamentary sympathisers among the gentry were also been hesitant in declaring their support. According to the ‘Gentlemen’s Petitions’ reprinted in Nichols, supporters from outlying parts of the county hastened to reassure Parliament it was ‘not backwardness to serve you, or want of affection, but the remoteness of their dwellings’ that prevented their attendance, Their fearfulness was well founded. In 1643 the Earl of Stamford found that while he was away fighting for Parliament his house at Bradgate had been ransacked, ‘all his horses and cattle driven away, his tenants so plundered that they are made incapable of paying any rents’. The approach of the king’s army severely tested the resolve of the most committed parliamentarian. When the county committee sent out warrants to defend Leicester in 1645 those who responded ‘came but slowly . . . many came that meant not to fight: there were not of them above 150 that were willing to take up arms’, an understandable reticence considering that the town was later sacked and many of its defenders slain or held to ransom. The level of involvement of the local clergy reflects deeper, religious commitment to the monarch or to individual conscience. Nine clerks from Sparkenhoe Hundred are listed among those who suffered sequestration for supporting the king. Judging from his ‘commonplace book’ Abraham Mould, the Appleby incumbent who lost his living to an ‘intruder’ in 1656, was very troubled by the conflict though there is no indication that he preached against Parliament or took any active part in the war. Francis Standish, the vicar of Swepstone, was one of many who joined the king's forces ‘before men could well recollect themselves’. Though he denied that he had gone ‘scouting in the night’ with troops from Ashby, he seems to have spent time in at least three of the Royalist garrison towns and was accused of giving the enemy tithes at Snarestone in 1644. Others, like Thomas Cleveland of Hinckley and John Lufton, rector of lbstock, offered money or prayers. William Holdsworth, the incumbent of Earl Shilton, openly reviled the Parliament and stood accused of reading a Royal Protestation in the middle of a sermon, while Mr Crosley of Whitwick was charged with calling Parliamentary supporters ‘traitors, worse than gunpowder plotters’. Some of the more outspoken of the Royalist clergy from the south-west may have been among the ‘24 parsons in canonical coats’ who rode with Hastings’s cavaliers to read out the king’s commission outside Leicester on the eleventh of June 1642 as recorded in Chambers and Stansforth’s report to Parliament. The most uncompromising of these, men like Roger Porter of Orton, were hounded out of their livings by their own parishioners. Several who took refuge at Ashby, were accused of plundering and informing upon their former parishioners. Those that remained found themselves at the mercy of Parliamentary soldiers from the local garrisons. One such ‘martyr’ recorded by Walker in his account of the Sufferings of the Clergy, was William Pestell of Coleorton who was taken to Tamworth and beaten ‘black as a shoe’. The elder Thomas Pestell of Packington was charged for keeping a pack of beagles and hounds,and ‘damaging neighbours’ property without redress’. His son who was chaplain to the Earl of Huntington at Ashby was accused of plundering his neighbours, though he declared in his defence that ‘so far from getting neighbours into trouble he got some released’. The clergy who openly sided with Parliament were easy targets for Royalist raiding parties. The most remarkable instance of this took place in March 1644, when a large number of clergymen and churchwardens were summoned to Leicester to sign the National Covenant, declaring their support for Parliament. According to intelligence reports Colonel Hastings, with four troops of horse from Beaver-Whorton House ‘coursed about the country as far as Dunton and Lutterworth, and took near upon an hundred of the clergymen and others’, carrying them as prisoners to Hinckley. A later report described the dramatic rescue of these captives. According to a Letter to Lord Grey their number had by this time shrunk to only two ministers and thirty ‘countrymen’. Hastings's well publicised threat to hang any that dared sign the Parliamentary Covenant has had a sobering effect as a warning to the clergy in the parishes within reach of his garrisons. As speakers in Parliament itself admitted that same year, ‘neither the persons nor the goods of the inhabitants and well-affected to the Parliament are secure in any part of the county’. It is difficult to identify the origins of ordinary soldiers below the rank of gentry: there is little evidence of rank and file recruitment from southwest Leicestershire. Campaign reports, news sheets, diaries and letters, the usual sources of information about military matters, do not provide statistics of support from individual parishes or regions and the garrison muster rolls, where they survive, seldom mention the origin of recruits. Conversely, village records belonging to the vestry and the manorial court rarely mention military enlistment or refer to outside ‘commotions’. The Appleby records provide hardly any indication that there was a war on. A search for householders’ names disappearing from parish registers around 1642 to reappear subsequently on a garrison muster roll might be expected to throw some light on this matter. 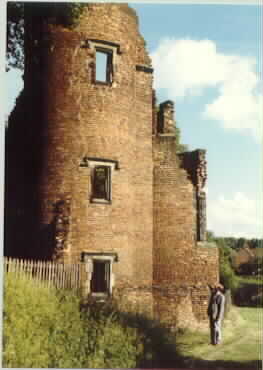 In Austrey on the north Warwickshire border for example, several of the villagers including Henry Kendall, the lord of the manor and three of his tenants, appear in the parliamentary garrison musters for Maxstoke Castle. Yet, a comparison of names from the Appleby register with a series of musters rolls for the Parliamentary garrison at Tamworth fails to yield a single confirmation of recruitment from the parish. Nor is there any hint of Appleby villagers quartered at Ashby. One explanation for this could be that the villagers followed the example set by their landlords, the local gentry and freeholders, who had Royalist leanings but were wary of declaring themselves (although of course some of the royalist gentry from places like Swepstone and Sutton Cheney brought their tenants and retainers with them). While the orders for Hastings’ impeachment in June 1642 refer to his ‘wickedly and maliciously’ recruiting some three hundred men from Derbyshire, Lincolnshire and Leicestershire, a large proportion of these appear to have been Derbyshire colliers rather than Leicestershire villagers. Conflicting loyalties and a natural desire not to offend their neighbours or prominent men on either side, may help to explain the lack of enthusiasm for enlistment in rural areas. The response of the trained bands and the constables to proclamations calling out first the Militia, and then the Commission of Array, is instructive in this regard. Although Parliament claimed ‘a good appearance’ of the bands in three of the five Leicestershire divisions, there was some apprehension at the ‘approach near to Mr Hastings’s quarters’: the head constable of one unspecified district refused to deliver the warrants, ‘being persuaded by the parson of the town where he lives’ according to a letter from Ruthvin and Hesilrigg propounding to be A true relation…of the Militia in the county of Leicester Mr Lufton, the rector of lbstock, was but one of several Royalist clergy who tried to dissuade villagers in the trained bands from going to Leicester on the eighth of June, in response to the Parliamentary warrant. Captain Wolesley and ensign Dudley of the Ashby garrison later stood accused of similar obstruction according to the Journal of the House of Lords. Wolesley on one occasion even offered to pawn his own lands and to forfeit his own life to save George Moore, the constable of Whitwick, should he refuse to obey the summons, while ancient Dudley warned John Mills of Donnington-on-the-Heath that ‘his estate was lost, and his life hazarded’ if he did obey the summons! These strategems probably met with greater success in north Leicestershire, where the Royalists could count on support, than in the southwest, where the mood of the inhabitants swung in favour of Parliament. Parliamentary threats and remonstrances certainly had some effect in dampening support for Lord Hastings in his attempt to assemble a Commission of Array at the Raw Dikes near Leicester two weeks later. If we are to believe Stamford as recorded in A true relation ... of the Militia, only a handful of his supporters even bothered to show up. all the six (Leicestershire) hundreds were thus disposed of; two to Cole Orton and Bagworth, two to the garrison of Kirby, and two to Leicester; and the moneys were all received by collectors and treasurers appointed for every garrison . . The committee acknowledged that it had been granted powers to raise six hundred pounds a week, but complained that it barely saw half this amount, partly because Framland hundred was ‘almost totally cut off’ by the Royalists. The Royalists relied upon a similar system of levies but the commanders prefer to send the garrison quartermasters to collect the contributions instead of allowing the constables to bring them in, Hastings himself, in his capacity as high sheriff of Leicestershire, signing the warrants. The importance of these levies has given rise to some curious mutual arrangements, such as those discovered by Martyn Bennett at Stathern in the Vale of Belvoir, where the rival garrisons collected their levies on consecutive days. However, no evidence has yet been found to confirm whether such arrangements were made in the south-western region. Any accommodation would almost certainly have been abandoned after Parliament gained ascendancy with the collapse of the Royalist north in 1644. The surviving Parliamentary accounts for Warwickshire catalogued among the ‘State Papers’ in the Public Record Office, reveal that parishes the size of Polesworth paid as much as nine pounds a week. We know that the inhabitants of Grendon and Wisham in Hemlingford Hundred in Warwickshire paid taxes both to Parliament and to the Royalist garrisons at Ashby and Lichfield, which suggests that many of the southwest Leicestershire parishes, including Appleby perhaps, faced a similar predicament. While the actual payments are uncertain, one of the Parliamentary Assessments from 1647 reveals that the eighty or so townships in Sparkenhoe Hundred were rated at £81.1 5 a month, with individual places contributing amounts ranging from 2s 8d for the hamlet of Wilkinghill to £2.8.4 for the combined parishes of Burbage and Sketchley. In addition to these fixed levies Parliament required that persons worth more than ten pounds a year in land or a hundred pounds in personal estate should lend up to one fifth of their revenue from land or a twentieth of their goods in the form of a ‘Proposition tax’ pledged for repayment through the Public Faith. It is hardly surprising given the large sums involved, to read complaints that ‘Many aspersions are laid on the Committee of Leicester ... and also by one Lilly in a printed book’, that the committee is making itself ‘rich with the county’s money’. In fact, as the committee points out, the levies mostly went to the support of the garrisons, who were often charged with being wasteful, while according to Mr. Nichols the committee members themselves saw their estates plundered and had their persons imprisoned in the service of Parliament. Only fragmentary evidence survives to assess the material losses and depredations inflicted by the Leicestershire garrisons on ordinary villagers. But some impression of the extent of forced requisitioning in the south-west region is provided by an Exchequer account ‘expressing particularly what free quarter, horses and other goods have been taken from the hundreds of Sparkenhoe, Guthlaxton and Goscote, by north Warwickshire garrisons’ [SP 28/161]. This illuminating account, drawn up in June, 1646 by Euseby Cradock , clerk to the Leicestershire county committee, refers to the five garrisons at Coventry, Warwick, Tamworth, Edgbaston House and Astley House listing one hundred and sixty three claims for reparation. All of them refer to losses caused by Parliamentary soldiers, though there can be little doubt that the Royalist garrisons were guilty of similar acts or worse, as attested by Hastings’s fearful reputation as a ‘Rob-Carrier’. While these claims represent only a few of the claims Cradock had to deal with - as he adds: ‘Much more it is believed will be charged upon the several garrisons so soon as the Country Books of Account come in’- the evidence is sufficient to confirm that the Parliamentary army’s recourse to free quartering caused considerable hardship to some of the villagers. Raiding parties from north Warwickshire seem to have been particularly active in south-west Leicestershire between 1643-1646. Troops from the Coventry garrison visited at least twenty townships in Sparkenhoe Hundred during this period. They usually arrived in fairly large numbers and stayed one or two nights before going on their way. Captain Flower and Captain Ottway, with their combined troops of around a hundred men, made frequent appearance in the region. The townspeople of Sutton Cheney charged the Coventry garrison five pounds for quartering them while the inhabitants of Sheepy Magna claimed double that amount. The largest claim for free quarter was for a force of two hundred and eleven troops and seventy two horses under Colonel Purefoy and Colonel Bosseville, of Coventry when they set up camp at Hinckley to lay siege to Tamworth in the summer of 1643 . According to R.E. Sherwood the townspeople of Hinckley also played host to one of ‘Tinker Fox’s’ celebrated raiding parties when they provided quartering for twenty three horsemen for a single night in 1644. A common source of complaint by local villagers is the requisitioning of horses, variously described by the Parliamentary committee as ‘stoned horses’, ‘black geldings’, ‘old nags’ &c. valued from five pounds down to five shillings. Between 1643 and 1646 soldiers from the Coventry garrison are alleged to have taken fifty two horses worth an estimated £289 from Sparkenhoe Hundred, while soldiers from Tamworth made off with at least fifty and the Astley garrison took eleven more. At Bilston, two days after the battle of Naseby, Henry Sealey claimed that Captain Bridge’s soldiers made off with one of his horses, leaving a lame one in its place. Most of the requisitioned horses appear to have been fresh mounts taken more or less at random in the heat of battle or flight but occasionally there may have been a punitive motive. When a detachment of troops from Tamworth visited Appleby Parva in June 1646, not long after the surrender of the Ashby garrison, they rode off with ten horses, two belonging to Charles Moore, the lord of the manor, and a mare apiece from some of the more substantial yeoman tenants, including John Wilson, Isaac Shilton, Thomas Taylor, William Smith, Thomas Hartell, John Proudman, Richard Walker and Richard Watha. While Moore was no activist, he might well have harboured Royalist sympathies. It may be of some significance that none of the householders in nearby Appleby Magna, who were tenants not of Mr Moore but of Bosworth Grammar School, claimed for losses on this occasion. Parliamentary troops have often given orders for feed or ‘provender’ to be carted from place to place, leaving the local inhabitants to claim for reimbursement. According to the accounts, Captain Flower while temporarily billetted at Stoney Stanton ordered the delivery of twenty strikes of provender by the inhabitants of Burbage and Sketchley. On another occasion (or at the same time - the accounts are somewhat vague when it comes to dates) his troop ordered two quarters of provender from Stapleton. Coventry forces took twelve strikes of oats and three of peas from Mr George Turton of Aston Flamville. Warwick forces requisitioned forty nine pounds of cheese from Frolesworth, while the inhabitants of Swinford in Guthlaxton Hundred were instructed to convey provender from there to Leire ‘by warrant from Mr Mills, the quartermaster of Killingworth [Kenilworth] Castle’, at that time under the control of the Warwick garrison. Hastings’s men attempted to escape, but the Parliamentarians took forty of them prisoner with sixty horses and the entire load of requisitioned hay, an incident revealing the desperation of the Ashby garrison as the Parliamentarians tightened their control of the surrounding villages. Accusations of outright plundering are not as frequent as might be supposed and even the Ashby garrison was not as rapacious as it was painted. As Martyn Bennett points out, ‘any army which plundered and ruined the country in the manner attributed to Hastings’ crew would not survive very long’ [pg. 48] But sporadic looting of portable items such as horse gear, money and clothing, by both sides, was considered ‘fair game’. Firearms were particularly prized. The Leicestershire committee was told for instance that George Nix, a Coventry soldier, stole a pistol worth four shillings from Richard Cooper of Hinckley. In June 1643, following the fall of Tamworth, captain Willington's men requisitioned two muskets worth two pounds from Robert Tarleton of Shenton (presumably to prevent them failing into enemy hands). Occasionally the public good was used as an excuse for looting, as is revealed in a claim by Mr Belgrave of North Kilworth, who was deprived of ‘saddles, bridles, boots, spurs, swords, … daggers, belts ... upon pretence of public service’. William Mousely of Sibberston accused Colonel Purefoy himself of forcibly taking ‘money lent to the state’s use’. Householders in Ashby Folville complained of having to give small sums of money to soldiers from Warwick upon threat of plunder of their houses, while Astley House troopers stood accused of taking a rapier, a swordbelt and ‘a snapsack’ from old Mr Goodall of Earl Shilton. Another cause of dissatisfaction - part of the ‘social cost’ of the war - was the practice of hostage-taking. We saw that the Ashby garrison took hostages at Hinckley, but further confirmation of this practise comes from a report of the king’s army setting out from Ashby to lay siege to Leicester towards the end of May 1645 where it is said that Prince Rupert’s forces did ‘very much spoil the county and [impoverish it], imprisoning and ransoming the men’, as attested in the Calender of State Papers Domestic, 1644-5. Some soldiers from the Parliamentary garrisons were accused of taking hostages for ransom in Mr Cradock’s account, though usually the demands were for paltry sums which were settled promptly. The main offender in this regard seems to have been Lieutenant Hunt of the Astley garrison who allegedly held the constable of Upton until a payment of £1.10.0 was made for his release. Matthew Pone, the constable of Hinckley, and Thomas Keene of the same town, were imprisoned at Astley House until a ‘fine’ of five pounds apiece secured their release. Around Michaelmas 1643 Hunt is said to have forced Francis Orton of Witherley to pay £1.13.4 for his freedom. These petty inflictions were part of the pattern of intimidation and coercement practised by both sides in an attempt to assert their control over the region. The evidence presented in this survey confirms that the presence of the garrisons in and around southwest Leicestershire certainly had a detrimental though not catastrophic impact on the lives of the local villagers. The evidence suggests that with the exception of the handful of gentry who attached themselves to the main field armies of each side and the Royalist clergy who sought sanctuary with Hastings, the population at large show little enthusiasm for the conflict. Reports of armed incursions and pillaging by the Royalists and of forced requisitioning by the Parliamentary garrisons tend to confirm the impression that as the war progressed the collection of levies and taxes for the support of the garrisons put an increasingly heavy financial burden on ordinary villagers, which made them even more anxious for a settlement of the conflict. Furthermore, the physical threat posed by Royalist raiding parties from Ashby, and by Parliamentary troops from as far away as Coventry, served to intimidate the local villagers into ‘neutral’ or passive attitudes, in conformity with those of the majority of the local gentry. The fall of Ashby in March 1646 was a symbolic end to local anarchy and disorders on a wide scale which met with widespread expressions of relief. While many probably shared Vicar’s opinion that the surrender of Ashby was ‘a great mercy and mighty preservation of the peace and tranquillity of all those adjacent parts about it’ most would probably have been equally relieved had the tide turned to bring a Royalist victory. Parliamentary newsheet: Perfect Diurnal, 16th Nov., 1644 printed in J. Nichols, ‘Civil War in Leicestershire’, Appendix IV, History and Antiquities of the County of Leicester, Vol. III,ii, 1804, p. 39. Gentry alignments in M. Bennet, ‘Leicestershire’s Royalist Officers and the War Effort in the County, 1642-1646’, Transactions of the Leics. Arch. & Hist. Soc. LIX, 1984-5,and D. Fleming, ‘Faction and Civil War in Leicestershire’, Idem, LVII, 1981-2, pp 26-7. Narration of the siege and taking of the town of Leicester reprinted in Nichols, pg. 48-54; Reference to garrisons in Calendar of State Papers Domestic, 1644, p 285. Royalists listed in Calendar of the Committee for Compounding , I , pp. 110-111; British Library, Harleian MSS, 2043, No 2, fols. 38 & 40. Gentlemen’s Petitions to the House of Commons and House of Lords, February 15, 1642 reprinted in Nichols, p.17. Journals of the Lords, October 30, 1643 in Nichols, p 32. cf. pp.19-23. Summaries of sequestrated clergy from A. G. Matthews, Walker Revised, 1948, pp 234, 235, 237, 240 & 245. Report by Chambers and Stanforth to Parliament in Nichols, p. 25. Vicars in Nichols, p 33; Letter to Lord Grey, March 6, 1644 in Nichols, p. 34. Commons Journal in Nichols, p. 36. Tamworth musters, Public Record Office (PRO): SP 28/121A & SP 28/122. Letter from Ruthvin and Hesilrigg to Commons, and A true relation of the transaction of the commands of both houses of Parliament in the execution of the Militia in the county of Leicester, in Nichols, pp. 22-23. Polesworth levies in PRO: SP 28/136/33. Double taxation in A. Hughes, Politics, Society and Civil War in Warwickshire, 1620-1650, Ph.D. thesis, Liverpool University, 1980, pp 340-1; for other examples of double taxation, see R E. Sherwood, Civil Strife in the Midlands, 1974, pp. 104-5. For some of Colonel Fox's exploits, R. E. Sherwood, pp. 13-14, 117-18 et seq. Whitlock quoted in Nichols, p. 40. John Vicars’ remarks on the surrender of Ashby recorded in Nichols, pg 66.